*$19.95 ACTIVATION, EARLY TERMINATION FEES ($20/MO. FOR TV; $15/MO. FOR INTERNET) FOR EACH MONTH REMAINING ON AGMT., EQUIPMENT NON-RETURN & ADD’L FEES APPLY. Price after $5/mo. autopay & paperless bill discount for 12 mos. Discount starts w/in 3 bills. New approved residential customers only (equipment lease req'd). Credit card req'd. except MA & PA. Restr’s apply. Combine any TV, Internet, home phone, or wireless phone service to create a custom package! 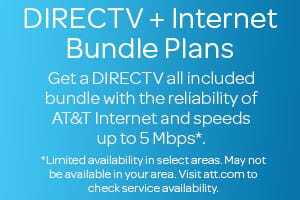 DIRECTV and U-verse TV: Great Alternatives to Cable! Everyone loves choices, especially good ones. Which is exactly what you get when you choose DIRECTV or U-verse® TV. 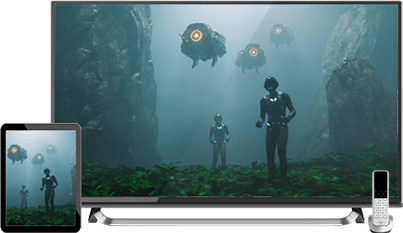 Two great choices for entertainment from one industry-leading company, AT&T U-verse and DIRECTV customers are some of the most satisfied TV customers in the industry. DIRECTV is number one in customer satisfaction compared to other major cable and satellite providers. * So switch to DIRECTV or U-verse TV and see what everyone is raving about. *Claim based on 2017 ACSI survey of customers rating their own Internet provider’s performance. $85 1-YR BUNDLE: Ends 6/30/19. Pricing: All Included TV pkg pricing includes monthly fees for one Genie HD DVR and standard prof’l installation. $5/mo. discount: Must enroll in autopay & paperless bill within 30 days of TV activation to receive bill credit starting in 1-3 bill cycles. First time credit will include all credits earned since meeting offer requirements. Must maintain autopay/paperless bill and valid email address to continue credits. No credits in 2nd year for autopay. Pricing subj to change. 1st & 2nd year pricing: $85/mo for first 12 mos only. Includes CHOICE All Included pkg ($45/mo), Internet ($40/mo) for Internet speed tiers (10M to 100M) & Wi-Fi Gateway. After 12 mos. or loss of eligibility, then prevailing rate applies (currently $150/mo. ), unless cancelled or changed prior to end of the promo period. Must maintain all qualifying services and service addresses must match to receive advertised pricing. Exclusions: Price excludes Regional Sports Fee of up to $8.49/mo. (which is extra & applies in select markets to CHOICE and/or MÁS ULTRA and higher Pkgs. ), taxes, $19.95 ACTIVATION fee, applicable use tax expense surcharge on retail value of installation, equipment upgrades/add ons, and certain other add’l fees & chrgs. Some offers may not be available through all channels and in select areas. Different offers may apply for eligible multi-dwelling unit customers. AT&T PHONE: AT&T Phone service is provided over an Internet Protocol connection and powered by electricity in your home. AT&T Phone service including 911 dialing, will not function during a power outage without battery backup power. It is your responsibility to purchase any necessary battery backup units for your service. See att.com/batterybackup. $124.99 1-YR BUNDLE: Ends 6/30/19. Pricing: All Included TV pkg pricing includes monthly fees for one Genie HD DVR and standard prof’l installation. $5/mo. discount: Must enroll in autopay & paperless bill within 30 days of TV activation to receive bill credit starting in 1-3 bill cycles. First time credit will include all credits earned since meeting offer requirements. Must maintain autopay/paperless bill and valid email address to continue credits. No credits in 2nd year for autopay. Pricing subj to change. 1st & 2nd year pricing: $124.99/mo for first 12 mos only Includes ULTIMATE All Included pkg ($60/mo), Internet ($40/mo) for Internet speed tiers (10M to 100M), Wi-Fi Gateway and Phone Unlimited North America ($19.99/mo). After 12 mos., then-prevailing monthly rate applies (currently $194.99/mo. ), unless cancelled or changed by customer prior to end of promo period. Must maintain all qualifying services and service addresses must match to receive advertised pricing. Exclusions: Price excludes taxes, $19.95 ACTIVATION fee, applicable use tax expense surcharge on retail value of installation, equipment upgrades/add ons, and certain other add’l fees & chrgs. Some offers may not be available through all channels and in select areas. Different offers may apply for eligible multi-dwelling unit customers. $179.99 1-YR BUNDLE: Ends 6/30/19. Pricing: All Included TV pkg pricing includes monthly fees for one Genie HD DVR and standard prof’l installation. $5/mo. discount: Must enroll in autopay & paperless bill within 30 days of TV activation to receive bill credit starting in 1-3 bill cycles. First time credit will include all credits earned since meeting offer requirements. Must maintain autopay/paperless bill and valid email address to continue credits. No credits in 2nd year for autopay. Pricing subj to change. 1st & 2nd year pricing: $179.99/mo for first 12 mos only Includes PREMIER All Included pkg ($110/mo), Internet speed tiers (10M to 100M) ($40/mo), Wi-Fi Gateway and Phone Unlimited North America ($19.99/mo). After 12 mos., then-prevailing monthly rate applies (currently $248.99/mo. ), unless cancelled or changed by customer prior to end of promo period. Must maintain all qualifying services and service addresses must match to receive advertised pricing. Exclusions: Price excludes taxes, $19.95 ACTIVATION fee, applicable use tax expense surcharge on retail value of installation, equipment upgrades/add ons, and certain other add’l fees & chrgs. Some offers may not be available through all channels and in select areas. Different offers may apply for eligible multi-dwelling unit customers.